One of the more interesting matchups in Week 16 of the NFL season will take place at Heinz Field in Pittsburgh, Pennsylvania Sunday afternoon. The 9-5 Pittsburgh Steelers are currently in 1st place of the AFC North and will host the 2nd placed 8-6 Baltimore Ravens. The contest will be televised on NFL Network with a start time of 4:30 PM EST. The Steelers opened as a 4-point favorite with the total set at 44.5. The wagers have come fairly equally distributed between the two sides, but the spread has moved to Pittsburgh -6 as of the publication of this article. The under is 3-0-1 in the last four meetings in the series. The Ravens defeated the Steelers 21-14 as a 3.5-point underdog home at Baltimore in Week 9, their fourth consecutive win in the head-to-head series. They’ve won three of their last four and five of their past seven overall and held on for a huge 27-26 win against the Eagles last week. They held the Eagles’ rookie quarterback Carson Wentz without a touchdown pass and just 22-of-42 passing for 170 yards while their own signal-caller Joe Flacco was 16-of-30 passing for 206 yards, a pair of touchdowns and a pick. Running back Terrance West had a strong game with 77 yards rushing and 45 yards receiving. Baltimore has built its success around a defense that has allowed only 18.8 points per game this season. The Ravens rank fifth overall in yards allowed per game (312.6 yards per game) and second against the run (82.1 yards per game). Offensively the Ravens are scoring 21.9 points per game, and they are very pass oriented as they average 347.1 yards per game but just 90.6 yards per game on the ground (28th). The Ravens are 6-2-1 ATS in their last nine road games vs. a team with a winning home record but 0-5 ATS in their last five road games overall. 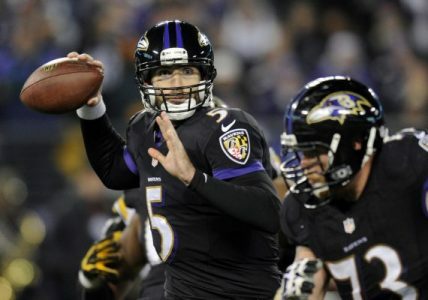 The under is 5-1 in Baltimore’s last six vs. AFC North rivals. The Steelers have won five consecutive games and would clinch the division with a win here. They came back from a 20-9 halftime deficit at Cincinnati to win the game 24-20 last week, and their defense did a great job shutting down the Bengals completely in the second half. Pittsburgh’s quarterback Ben Roethlisberger did not have one of his better games but was 21-of-36 passing for 286 yards and a touchdown pass. Le’Veon Bell rushed for 93 yards on 23 attempts, and he leads the NFL with 158.8 yards from scrimmage per game. The Steelers have a solid defense that has held opponents to 19.7 points per game on average. Much like Baltimore they’re terrific at stopping the run and rank 5th in the NFL allowing only 89.1 yards per game on the ground. Offensively the Steelers are very well balanced and average 24.4 points per game. The Steelers are 13-3 ATS in their last 16 games in December and 4-1-1 ATS in their last six vs. AFC North opponents. The under is 6-2 in Pittsburgh’s last eight vs. a team with a winning record and 19-6-1 in its last 26 vs. AFC North.